For years, the retail industry has talked about omnichannel capabilities and consumers' demands for a seamless shopping experience regardless of what channel they find themselves on (wanting access to all inventory, all sales and all fulfillment options), but Holidays 2015 seemed to be the year retailers actually kept many of their promises...largely with buy online, pick up in store. 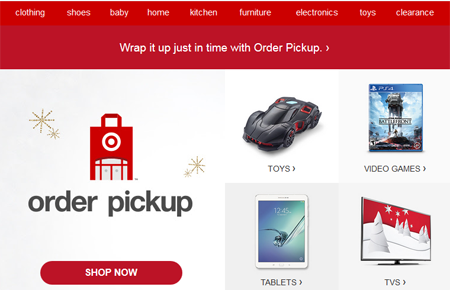 Retailers pushed this offering up until the final days before Christmas, giving last-minute shoppers the ability to shop online and pick it up in store after the shipping deadlines had passed (like Target's email example below) - and to positive effect. Findings from eBay Enterprise's Digital Commerce Index based on data from millions of orders processed in 2015, shows e-commerce order volumes fulfilled by stores increased 72 percent during peak season. This is important as this provides a choice for the consumer who, of course, does not view a brand in fragmented channels, rather as one continuous experience (a challenge for retailers to keep up with). Brick-and-mortar stores also played a role in mitigating out-of stock situations. In fact, data from the eBay Enterprise Digital Commerce Index also showed a significant uptick in Ship-from Store orders on Cyber Monday – an increase of more than 30 percent in sales and order volume over 2014. Retailers that used Ship-from Store were able to respond to demand and leverage stores to eliminate a significant amount of lost sales due to out-of-stocks, according to eBay Enterprise. Some takeaways for retailers from eBay Enterprise's report is that a priority must be made on the fulfillment of orders whether they are in store, online or a combination of the two and that as more retailers actually keep their promises of omnichannel capabilities, everyone will have to step up their games because consumer expectations will increase even more. It should be noted that prior to eBay Enterprise's index findings, the company released a 2015 holiday consumer expectation surveys that, among other findings (a snippet of an infographic used to demonstrate its report is shown below) that a large majority of shoppers want items shipped to them, but pick up in store has gained momentum, largely because it's a way to save on shipping costs. What this finding indicates is that those e-commerce retailers without brick-and-mortars will have to combat the expectation that store pickup is an option by lowering or in many cases eliminating shipping costs. Easier said than done, of course, but Website Magazine published some strategies for this in, "9+ Shipping & Return Strategies to Know."